This entry was posted on July 19, 2010 at 2:14 am and is filed under Ancient History, Heroes of Vietnam Week with tags 1000 Years of Chinese Occupation, Chinese Occupation, Hai Ba Trung, The Trung Sisters. You can follow any responses to this entry through the RSS 2.0 feed. You can leave a response, or trackback from your own site. It is said that Ma Vien (Ma Yuan) was the Han’s greatest general. He and his army faced the Trung Sisters many times. He decided that the only way to defeat them is for the army to dress naked and fight the Trung Sisters. This embarrassed them and they commited suicide. When he returned back to the Emperor, the Emperor was very ashamed of how his greatest general could only defeat the enemy by getting his army to strip naked. He banished Ma Vien. Very meaningful! Need to be modified with proper words! This can be used for younger generations to study for traditional values of Vietnamese people. 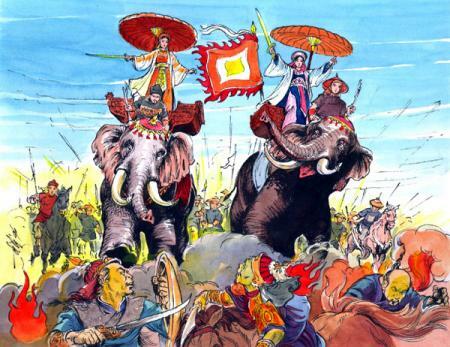 The spirit of fighting the invaders was initiated by Vietnamese women more than 2000 years ago. And throughout Vietnamese long history, many Vietnamese women have been fighting the invaders along side with Vietnamese men. As of to date, an organization ” Vietnamese Women for Human Rights” has been formed in the communist Vietnam to fight for their human rights where no independent political or social organization is allowed. Again, history is being made by Vietnamese women who lead the fight for human rights for Vietnamese people. I have utmost respect for the Vietnamese women who take care of the family during peace time and defend the country in time of being invaded.